The Coral Hotel Shatti Al Qurum Muscat is an elegant boutique hotel built like a ship reflecting the tradition that depicts the seafaring history of the country and the hospitality that Oman is so well known for. Overlooking Shatti Al Qurum Beach, nestled within Muscat residential and embassy district, this unique luxury hotel is 20 Kilometers away from Al Seeb International Airport and only 15 kilometers from the heart of the city center. 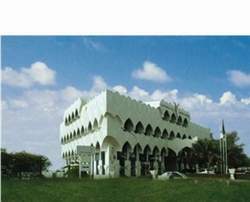 The Best Western Muscat Hotel is an elegant boutique hotel. Built like a ship reflecting the tradition that depicts the seafaring history of the country and the hospitality that Oman is so well known for. Overlooking Shatti al Qurum beach in the Muscat residential and embassy area, this unique luxury hotel is 20 kilometers away from Al Seeb International Airport and only 15 kilometers from the heart of the capital city Muscat. The Best Western Muscat Hotel offers 32 rooms with superb standards of service and is ideal for those who visit for business or pleasure. The luxurious royal and business suites have two bedrooms, living room, balcony and a kitchen each. They convey an atmosphere of warmth and hospitality that makes you feel at home.